Thousands of people have attended a march and street festival in Dublin to celebrate the Irish language this afternoon. 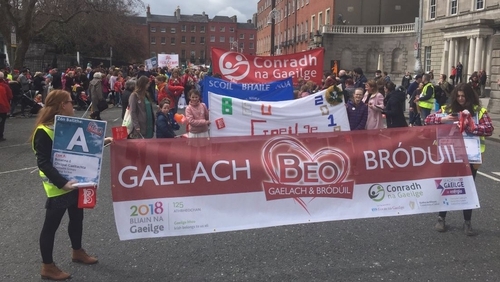 Language and community groups, schools, college societies, sports clubs and families, as well as groups from Gaeltacht communities are taking part in "Beo, Gaelach agus Bródúil". The event, which celebrated the achievements of the language during its revival in the last 125 years, is billed as one of the main events of Bliain na Gaeilge 2018. President Michael D Higgins was among the speakers who addressed the crowd in Merrion Square. He said the Irish language and the Irish language community was alive and vibrant as they seek to remind the state that they exist and that they have language rights. He said the State needs to lead by example in supporting the language and Irish language communities. Several music groups played to the crowd in Merrion Square this afternoon.